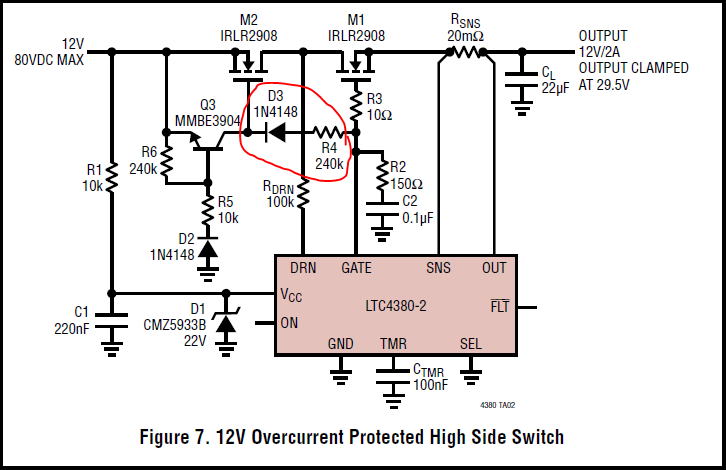 After going through several datasheets for devices from "Analog Devices’ family of high voltage surge stoppers, overvoltage protection, overcurrent protection, and circuit breaker ICs", I found that external reverse polarity protection is done by the same method but found some differences in some details. 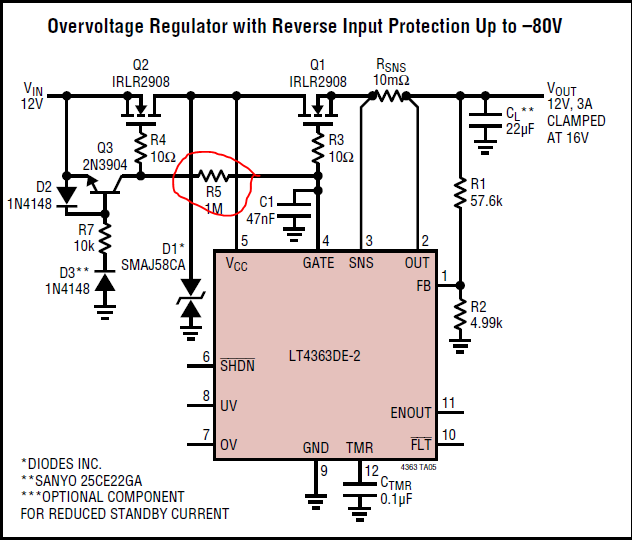 An explanation on how the reverse polarity protection circuit works is present in LTC4366 datasheet (page 20). I should note that the three controllers have similar absolute maximum rating for the gate pin negative voltage of -0.3V. The first circuit seems ideal as the diode D1 blocks excessive positive voltage from the input supply passing to the GATE and D2 prevents damage to the LTC4366’s GATE pin by clamping it at ground when the M2’s gate is negative. The 270k resistor R4 is small which will lead to faster switching-on time of M2. The second circuit rely on the large resistance R5 to block excessive currents from passing to the GATE pin in the event of excessive positive voltage at the input supply or negative voltages present at M2's GATE. The third circuit uses a diode to block the excessive positive voltage at the input supply but uses nothing to protect the GATE pin from negative voltages (perhaps rely on the resistance of R4(240k). My question is: If the three circuits are intended for the same purpose of reverse polarity protection, why am I seeing 3 different versions and most important which circuit is the best? Actually I think that none of the components you've circled in all the schematics are responsible for the reverse voltage protection at all (as you correctly pointed this out yourself in all three cases: "diode D1 blocks excessive positive voltage from the input supply", "R5 to block excessive currents from passing to the GATE pin in the event of excessive positive voltage at the input supply" and "a diode to block the excessive positive voltage at the input supply"). The secret actually lies more in the special arrangement of the diodes and transistors immediately near the input supply and the associated MOSFETs driven by them (D3, D4, Q2 and M2 in the first circuit, D2, D3, Q3 and Q2 in the second, plus the associated bias resistors of course). They ensure that voltage is only supplied to the circuits if it is of correct polarity. The 3rd circuit is a bit different in this manner (with the additional Zener diode D1 for regulation, probably because of this IC's wider input voltage range), but other than that the reverse polarity protection circuit is still the same (ensured by components D2, Q3 and M2). The mechanism of these circuits is explained in the LTC4366 datasheet you've linked in your question quite well I'd say. The case for surge protection is disconnection of the battery +ve terminal with an inductive load that results in a negative spike. The Gate voltage limit is due to the Schottky diode protection built in that cannot tolerate more than 1 mA or so external negative input at that voltage in order to protect the CMOS driver against the common SCR substrate failure mode. Thus the front end gate drive is thru a high resistance to withstand -500V or less depending on the design class and test criteria. The negative input spike ought to turn on the NPN to shutoff the front end FET but before this happens the CIss is sufficient to conduct the spike so the clamp must be fast and the collector R must be higher than 250k. The 1st design adds a diode OR clamp to ground to support this as well, using diodes with good VI characteristics at desired speed. Not the answer you're looking for? Browse other questions tagged power protection polarity reverse or ask your own question.